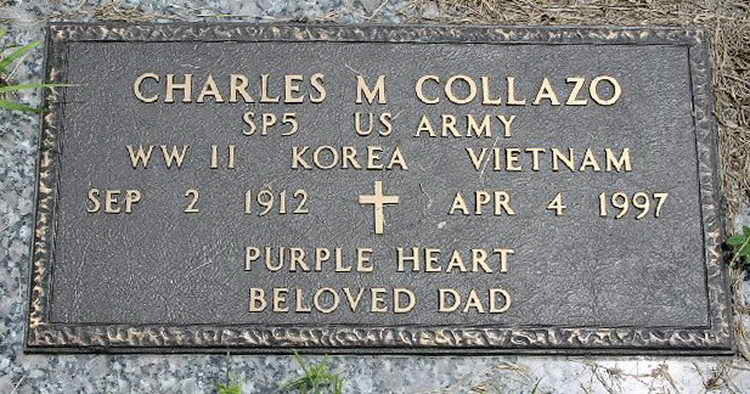 Grave marker for Charles M. Collazo in Veterans 1 & 2, Section 20 of the Garden of Memories Cemetery, Tampa (Hillsborough county), Florida. Charles enlisted at Cp Blanding, FL and was transferred from the Parachute School at Ft Benning GA to Company E, 508th in Camp Mackall, NC. On 2 September 1943 Pvt Collazo was transferred to Reception Station 990. He subsequently served during WWII, Korea and Vietnam attaining the rank of Specialist 5.th Class.